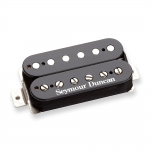 Medium output, gritty sounding humbucker that sparkles with upper midrange harmonic content. The brainchild of the incredibly knowledgeable forum members, this humbucker is the result of experimental coil swapping in order to push into new tonal territory. The mismatched coils, and the alnico 5 bar magnet keep the low end nice and tight, and give the mids a grind that is perfect for hard rock and metal. Plenty of crunch and bite on top as well. When split, you get the 59s 7k coil for a more distinct single coil sound.